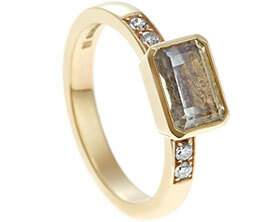 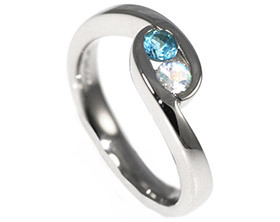 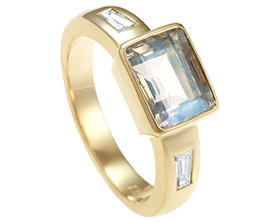 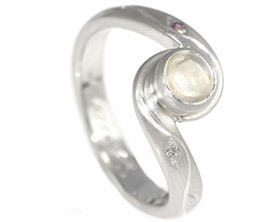 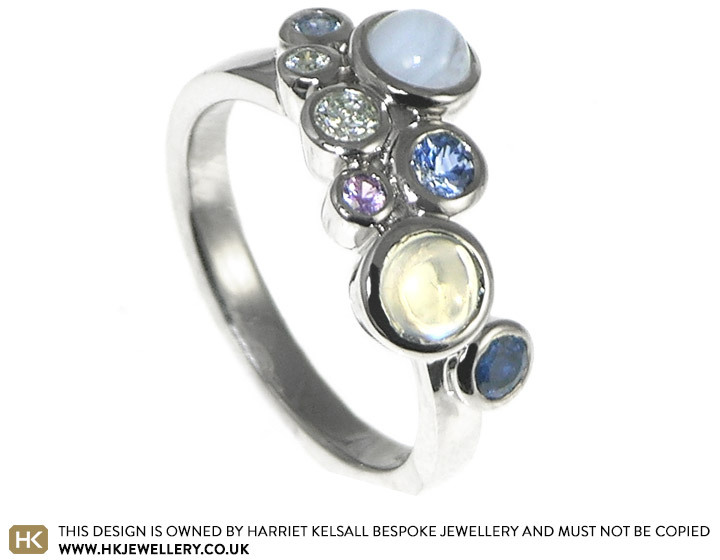 This ring, inspired by bubbles, is made from palladium.The colours of the blue and very pale lilac gemstones compliament eachother perfectly with the diamonds adding sparkle and the round facetted cuts contrast well with the cabochon smooth domes.This holds a 0.13cts round brilliant cut pale blue sapphire, a round brilliant cut 0.19ct dark blue sapphire, a cabochon round 0.40cts blue Sri Lankan moonstone, a round cabochon 0.52cts piece of blue lace agate, a brilliant cut 0.08cts pale blue sapphire, a 2mm brilliant cut round lilac sapphire, a 1.75mm H SI brilliant cut round diamond and a 0.10cts H SI1 round brilliant cut diamond.The band of the ring is about 2.5mm wide and the measurement from top to bottom where the stones are set is about 9mm at the widest point. 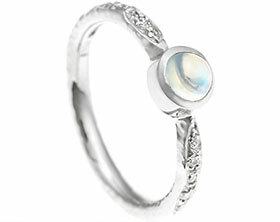 Platinum engagement ring with a rare blue sheen moonstone. 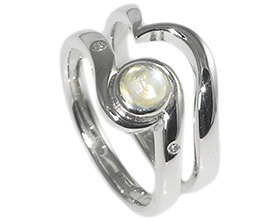 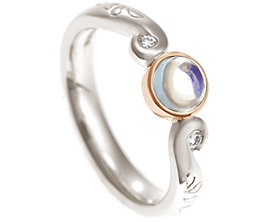 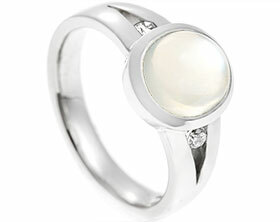 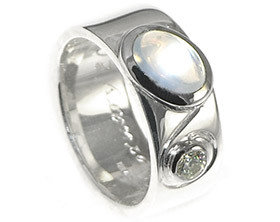 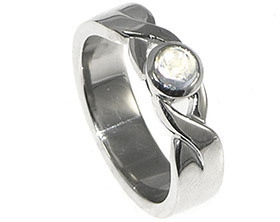 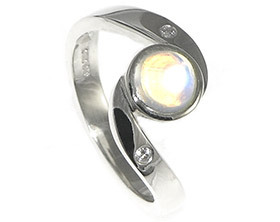 A Sterling silver ring with a rare large blue moonstone. 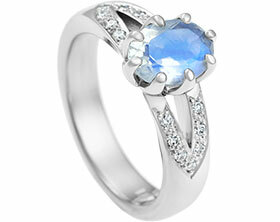 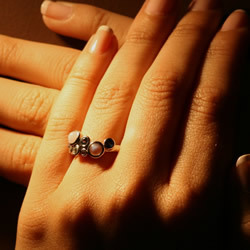 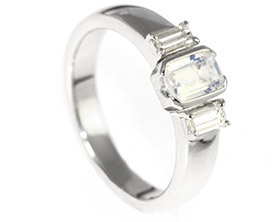 9ct white gold engagement ring set with a blue moonstone, Ceylon sapphires and diamonds. 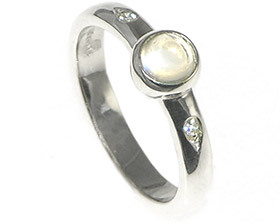 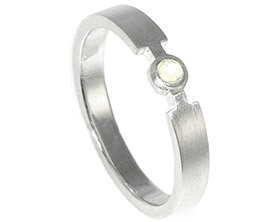 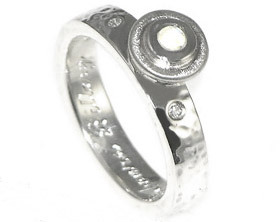 18ct White Gold Engagement Ring with a central blue moonstone.